The Washington Huskies football team represents the University of Washington in college football. Washington competes in the NCAA Division I Football Bowl Subdivision (FBS) as a member of the North Division of the Pac-12 Conference. Washington has won 16 Pac-12 championships, seven Rose Bowls, and claims two national championships recognized by the NCAA. Washington's all-time record of 710-440-50 ranks 19th by all-time winning percentage and 22nd by all-time victories. The team has two of the nation's longest winning streaks, including an NCAA second-best of 40 wins in a row, holds the Division I-A unbeaten record at 64 consecutive games, and has had a total of twelve unbeaten seasons, including seven perfect seasons. Washington is one of four charter members of what became the Pac-12 Conference and, along with California, is one of only two schools with uninterrupted membership. From 1977 through 2003, Washington had 27 consecutive non-losing seasons—the most of any team in the Pac-12 and the 14th longest streak by an NCAA Division I-A team. Through the 2011 season, its 357 conference victories rank second in conference history. Husky Stadium, located on campus, has served as the home field for Washington since 1920. The team is currently led by head Chris Petersen. Washington is often referred to as one of the top Quarterback U's due to the long history of quarterbacks playing in the National Football League, including the second-most QB starts in NFL history. All but three of the last 20 starting quarterbacks dating back to 1970 have gone on to the NFL. Football started at the University of Washington in 1889 under President Thomas Milton Gatch, two years before the school campus in downtown Seattle, Washington was relocated to its current location in the University District. The team's first game was played on November 28, 1889 in Seattle, resulting in a 0-20 defeat to the Eastern College Alumni before a crowd of 400 spectators. This represented the first collegiate football game in the Pacific Northwest. Washington played its first 26 seasons of college football from 1889 to 1915 as an independent. In 1916, Washington and three others joined to create the Pacific Coast Conference which evolved into the modern day Pac-12 Conference. Membership includes the PCC (1916–1958), Athletic Association of Western Universities or AAWU (1959–1968), Pacific-8 (1969–1978), Pacific-10 (1979–2010), Pac-12 (2011–Present). The Pac-12 Conference claims the history of each of these preceding conferences as its own. Washington and Cal are the only founding and continuous members in each of these successive conferences. After the Dobie era came to a close, Washington turned to a succession of coaches with mixed results. Claude J. Hunt (1917, 1919) went a cumulative 6–3–1 highlighted by the school's second PCC championship in 1919, Tony Savage (1918) 1–1, and Stub Allison (1920) 1–5. The era concluded with the team's move from Denny Field to its permanent home field of Husky Stadium in 1920. Washington athletics adopted the initial nickname of Sun Dodgers in 1919 used until 1922, before becoming the Huskies from 1923 onward. James Phelan succeeded Bagshaw for the 1930 season. The Notre Dame graduate guided the Huskies to a 65–37–8 record over 12 seasons. His 1936 team won the school's fourth PCC championship, but lost in the 1937 Rose Bowl to Pittsburgh 0–21. Phelan guided the Huskies to their first bowl game victory, beating Hawaii 53–13 in the 1938 Poi Bowl. In later years, he became the first former Husky head coach to also do so in professional football. Phelan was inducted into the College Football Hall of Fame in 1973. Howard Odell joined Washington in 1948 from Yale. In his five seasons from 1948 to 1952, he compiled a record of 23–25–2 with two winning seasons..
Darrell Royal was retained and led the 1956 team to a 5–5 record, before leaving to coach the Texas Longhorns where he won three national championships, was inducted into the College Football Hall of Fame in 1983, and had the Longhorn's stadium renamed in his honor (Darrell K Royal–Texas Memorial Stadium). Don James came to Washington from Kent State. During his 18-year tenure, James' Huskies won four Rose Bowls and one Orange Bowl. His 1991 team shared the national championship with Miami. The Huskies won 22 consecutive games from 1990–1992. James' record with the Huskies was 153–57–2. James won national coach of the year honors in 1977, 1984 and 1991 and was inducted into the College Football Hall of Fame in 1997. 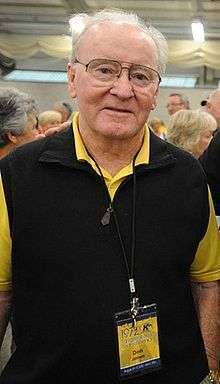 During the 1992 season, it was revealed that several of James' Huskies players received improper benefits, most notably starting quarterback Billy Joe Hobert. Although James and his staff were not personally implicated in any NCAA violation, James became upset with the NCAA's sanctions against his team and resigned as head football coach on August 22, 1993. Jim Lambright was promoted from defensive coordinator to head coach following the sudden and surprising departure of James. Lambright led the Huskies to four bowl appearances in his six seasons. Despite these bowl appearances and a 44–25–1 overall record, Lambright was fired by athletic director Barbara Hedges after a 6–6 1998 season. Rick Neuheisel was hired away from Colorado to take over as the Huskies' head football coach. During his tenure, the Huskies went 33–16, highlighted by a victory in the Rose Bowl in January 2001 over Purdue. Purdue's quarterback Drew Brees was out-dueled by Washington's quarterback Marques Tuiasosopo in an exciting game. Neuheisel also led the Huskies to two berths in the Holiday Bowl and to the Sun Bowl during his four-year tenure. Keith Gilbertson was promoted from offensive coordinator to head coach following Neuheisel's termination. Gilbertson's first season ended with a decent 6–6 record despite no bowl appearance. But a 1-10 season the next season ended in his firing. That 1–10 season is only Washington's second since the end of World War II. In two seasons, Gilbertson's record was 7–16. Former Notre Dame head coach Tyrone Willingham was hired as the next head football coach of the Washington Huskies. Willingham's Huskies failed to post a winning record in any of Willingham's four seasons, the best being a 5-7 2006 season. Willingham's record at Washington is a dismal 11–37, the worst winning percentage (.229) of any head football coach in Washington Huskies football history. Willingham was fired after a winless 2008 season. USC offensive coordinator Steve Sarkisian was named the 23rd head football coach of the Washington Huskies following the firing of Willingham. Sarkisian, known as an offensive mind and quarterbacks coach, helped develop Jake Locker into an elite college quarterback. Sarkisian never won more than eight games in a single season despite only one losing season. Sarkisian departed after the 2013 season to return to USC as the head football coach. Sarkisian's record at Washington was 34–29. Washington claims 1960 and 1991 national championships, with the NCAA record book additionally recognizing the 1984 and 1990 seasons. Bill Libby selected Washington as the 1910 National Champion. The 1960 team took an improbable road to the Rose Bowl and national championship. After suffering a 1-point setback to Navy in week three, the team reeled off eight straight league wins capped by a triumph over Associated Press #1 Minnesota in the Rose Bowl. Because the final Associated Press and United Press International polls were conducted after the final game of the regular season, Minnesota is the AP and UPI national champion for 1960. The postseason poll conducted by the Helms Athletic Foundation recognizes Washington as national champions. The Huskies opened the 1984 college football season with a 9-0 record which included a 20-11 win at #4 Michigan in Michigan Stadium. While being ranked #1 in the AP poll, the Huskies dropped a 16-7 game to eventual Pac-10 champion USC, which cost Washington a chance at the Rose Bowl. The Huskies instead were invited to play in the Orange Bowl against the #2 Oklahoma Sooners. The game is famous for the Sooner Schooner incident. After Oklahoma kicked a field goal to take a 17-14 lead in the fourth quarter, a penalty was called on the Sooners which nullified the score. The Sooner Schooner driver, who didn’t see the flag, drove the wagon on the field and was immediately flagged for unsportsmanlike conduct. The ensuing field goal attempt was blocked and led a momentum shift which saw Washington score two touchdowns in less than a minute en route to a 28-17 victory. Senior Jacque Robinson rushed for 135 yards and was named MVP, the first player in history to be named MVP of both the Orange and Rose Bowls. In winning, the Huskies became the first team from the Pac-10 to play in and win the Orange Bowl. The Huskies finished the year ranked #2 in the polls, behind the WAC champion Brigham Young (13-0-0), 24-17 victors over the unranked Michigan Wolverines (6-5-0) in the Holiday Bowl. BYU's title was notable for being the only time since the inception of the AP poll that a team was awarded the national title without beating an opponent ranked in the top 25 at the season's end. The Huskies were given the opportunity to play BYU in the Holiday Bowl but chose a larger bowl payout over playing a higher ranked opponent in BYU which carried a 22-game win streak into the bowl season. The B (QPRS), FN, and NCF polls awarded the Huskies the national championship, while the school does not claim it. The Huskies started out the season with two solid wins against San Jose State and Purdue, then welcomed 5th ranked USC and won 31-0. The next week they had a close loss to eventual AP national champion Colorado. After that loss, Washington went on to finish the season averaging over 40 points a game while only giving up 14. Also, during this time Washington would end up beating two more ranked teams on their way to the Rose Bowl. Yet, in the second to last game Washington lost to UCLA. Washington subsequently entered the Rose Bowl with a record of 9-2 looking for a victory over highly ranked Iowa. During the game, the Huskies won in dominating fashion with a final score of 46-34, displaying its trademark defense including a NCAA-best run-defense which allowed 66.8 yards per game. The AP said that the University of Colorado was the National Champion along with the UPI choosing the only undefeated team Georgia Tech. Washington was ranked #5 in the AP poll, receiving no first place votes. The Rothman/FACT, active from 1968–2006, stated that the Washington Huskies were National Champions for 1990, sharing the honor with Colorado, Georgia Tech, and Miami. The school does not claim this championship. The Huskies opened the 1991 season on the road, with a 42-7 victory over the Stanford Cardinal. Following a week off, Washington traveled to Lincoln, Nebraska for a showdown with #9 Nebraska. Trailing 21-9 late in the third quarter, Washington staged a rally, scoring 27 unanswered points to claim a 36-21 victory. The Husky offense, led by junior QB Billy Joe Hobert, gained a total of 618 yards. The 618 yards given up by the Cornhuskers was the most in 35 years. The following week saw the return of QB Mark Brunell, the 1991 Rose Bowl MVP who had suffered a knee injury in the spring, as the Huskies beat Kansas State 56-3, while holding the Wildcats to minus-17 yards on the ground. The Huskies followed with back-to-back shutouts of Arizona and Toledo. California was next and the Huskies traveled to Berkeley to face the #7 Golden Bears. Washington won a wild game that was decided on the final play when Walter Bailey broke up a pass on the goal line to preserve a 24-17 win for the Huskies. Oregon and Arizona State visited Husky Stadium next and each walked away with a loss. The Huskies went on their final road trip of the season, first to USC where they won in the Los Angeles Memorial Coliseum for the first time since 1980. Needing a victory to clinch a Rose Bowl berth, Washington rolled to a 58-6 win over Oregon State. The Washington State Cougars came to Seattle for the Apple Cup but were no match for the Huskies, as Washington won 56-21, setting up a showdown with Michigan in the Rose Bowl, held January 1, 1992. The Husky defense, led by Lombardi Award and Outland Trophy winner Steve Emtman, held Michigan to only 205 total yards, limiting Heisman Trophy winner Desmond Howard to only one catch. The Husky offense, led by quarterbacks Mark Brunell and Billy Joe Hobert, racked up 404 yards of total offense in leading the Huskies to a 34-14 Rose Bowl victory. Hobert and Emtman shared MVP honors. Washington has captured a total of 16 conference championships; this includes 4 PCC, 3 AAWU, 1 Pac-8, and 7 Pac-10, 1 Pac-12 championships, and at least one in every decade except the 1940s. Washington won the inaugural PCC championship in 1916. Washington's 16 championships rank third in league history, behind USC's 38 and UCLA's 17 as of 2013. The conference did not allow participation of a second bowl team beyond the conference champion, until 1975. Washington has captured a first ever Pac-12 North divisional championship title in school history. Washington has been continuously affiliated with the Pac-12 Conference and its predecessors, which have contractually agreed to send a representative (typically the conference champion) to participate in the Rose Bowl. The Big Ten Conference was similarly contracted following World War II. This pairing made the Rose Bowl the most prestigious Bowl Game available to Pac-12 teams, prior to the BCS era. The Washington Huskies have a long history and tradition of playing in the Rose Bowl. The Huskies' 14 Rose Bowl appearances are second only to USC in the Pac-10 and third overall (behind USC with 30 and the Michigan Wolverines with 19). The Huskies' seven victories are also third behind USC (21) and Michigan (8). In addition, Washington is also in an elite group of only seven schools to make back-to-back-to-back appearances in the Rose Bowl, a feat they accomplished in 1990–1992. The other schools are Ohio State, Michigan, and Wisconsin from the Big 10 and California, Stanford and USC from the Pac-10. Washington has won at least one Rose Bowl game in every decade since the 1960s. The Pac-8 did not allow a second bowl team from the conference until 1975. 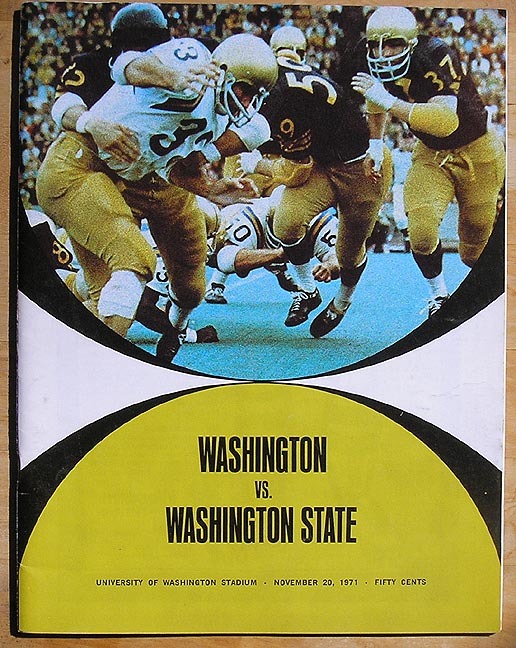 In the 1975 Apple Cup, Washington State led 27-14 with 3 minutes left in the game. WSU attempted a fourth-and-one conversion at the UW 14-yard line rather than a field goal. The resulting pass was intercepted by Al Burleson and returned 93 yards for a touchdown. After a WSU three-and-out, Warren Moon's tipped pass was caught by Spider Gaines for a 78-yard TD reception and a dramatic 28-27 Washington win. WSU Head Coach Jim Sweeney resigned a week later, leaving with a 26-59-1 record. When 14th-ranked Washington State and 17th-ranked Washington met in the 1981 Apple Cup, it was billed as the biggest game in the series since the 1936 game when the winner traveled to the Rose Bowl. Washington's defense was the best in the league, while the Cougars ranked high in the offenseive categories. The outcome of the UCLA-USC game, which kicked off 40 minutes before the UW-WSU game, also affected the game. The Huskies needed the Trojans to upset UCLA to clear the way for a Rose Bowl bid. With so much at stake, there was plenty of scoreboard watching by the frenzied Husky faithful. With his team trailing 7-3 late in the second quarter, Husky quarterback Steve Pelluer fired a low pass towards wide-out Paul Skansi. Washington State cornerback Nate Brady looked as if he would smother the ball when Skansi dove over the defender for an amazing catch in the endzone. Washington State drove the ball 69 yards to open the second half and tie the score at 10. From that point the Huskies- behind the fine play of their offensive line- took control. Ron "Cookie" Jackson capped an 80-yard march by running 23 yards to put the Huskies ahead 17-10. Following a Cougar turnover, All-American kicker Chuck Nelson booted his second field goal of the game to increase the Huskies' lead to 10 points. The fate of the Cougars was sealed when the score of the USC-UCLA game was announced- the Trojans had engineered an upset. The crowd went wild, Nelson added a field goal with less than three minutes to play, and the Huskies were off to the Rose Bowl. Heading into the 1990 season, the winner of the USC-Washington game had gone to the Rose Bowl in 10 of the previous 13 seasons. The 1990 match would substantiate that trend. Washington's All-Centennial team was feted the night before and introduced at halftime of the game, while two members of the historic team- Hugh McElhenny and Nesby Glasgow- delivered inspirational talks to the team. On a bright, sunny day with the temperature reaching 92 degrees, the crowd of 72,617 eagerly awaited the contest. They could not have imagined the outcome. For just the third time in 23 seasons the Huskies shut out USC, handing the Trojans their worst conference defeat in 30 years. "Student Body Right" was held to only 28 rushing yards as the Husky defense dominated the line of scrimmage. Greg Lewis the Doak Walker Award winner as the nation's top running back gained 126 rushing yards and sophomore quarterback Mark Brunell threw for 197 yards as the Huskies rolled to a 24-0 halftime lead. The Husky defense, led by All-American lineman Steve Emtman, stopped everything the Trojans attempted. The defense would hold USC to 163 total yards and seven first downs for the game. They would record three sacks and put so much pressure on Todd Marinovich that after the game, weary and beaten, he said famously: "I just saw purple. That's all. No numbers, just purple". Playing in their first night game since 1985, Washington posted an impressive victory against 12th-ranked Nebraska that might have provided the loudest moment in the stadium's long and boisterous history. When Nebraska quarterback Mike Grant dropped back to his own endzone to attempt a pass, everyone in the stands watched roverback Tommie Smith blitz Grant from his blindside and drop him for a safety. The deafening roar reverberating off the twin roofs literally had the stadium rocking. An ESPN sideline reporter armed with a noise meter reported that the clamor reached 133.6 decibels, the loudest decibel level ever recorded from a college football stadium (ESPN). Holding a 9-7 lead, the Husky offense went into quick-strike mode at the close of the second quarter. Speedy running back Napoleon Kaufman ended an 80-yard drive with a 1-yard scoring run. Walter Bailey intercepted Grant after the kickoff, and the Huskies went for the kill. Quarterback Billy Joe Hobert threw a 24-yard scoring pass to a diving Joe Kralik to boost the lead to 23-7. Kicker Travis Hanson then boosted a pair of field goals in the second half to cinch a 29-14 win, and jump the Huskies to number one in the wire service polls the following week. The 'Whammy in Miami' was a college football game played between the Huskies and the Miami Hurricanes on September 24, 1994 in Miami's Orange Bowl. The game was the first football contest between the two schools. During the 1991 season, both teams finished the year with identical 12-0 records and both teams were crowned National Champions. The teams were unable to settle the championship on the field, as both teams were locked into their respective bowl games (Washington in the Rose and Miami in the Orange). As a result, both schools agreed to schedule the other for a series of games. Entering the game, the University of Miami had an NCAA record home winning streak of 58 games, was ranked 5th in the nation and had a 2-0 record. The Hurricanes had not lost at the Orange Bowl since 1985 and not to a team from outside of Florida since 1984. The Huskies were 1-1, following a loss to USC and win over Ohio State. Odds makers placed the Huskies as a 14-point underdog. The Hurricanes appeared to be on their way to another home victory in the first half, leading the Huskies 14-3 at halftime. After halftime the Huskies came out firing scoring 22 points in 5 minutes. Key plays included a 75-yard touchdown pass, 34-yard interception return, and a fumble recovery. The Huskies showed no signs of slowing down and dominated the second half on the way to the 38-20 victory. With the game in Pullman, #3 Washington State entered the game poised for BCS National Championship game consideration, behind QB Jason Gesser. Gesser was injured by DT Terry "Tank" Johnson late in the game. The Cougars led 20-10 with less than 4 minutes left in the game, by Matt Kegel replacing Gesser. UW used a timely interception from freshman cornerback Nate Robinson to force Overtime. The teams traded FGs in the first two overtime periods, with John Anderson nailing a 3rd kick to start the third overtime period. In the Cougar's possession, Kegel was ruled by Gordon Riese to have thrown a backward pass which was knocked down and recovered by defensive end Kai Ellis, resulting in a fumble recovered by Washington to end the game. The Martin Stadium crowd erupted with some bottles being thrown by angry players and fans at celebrating players and fans. Then UW athletic director Barbara Hedges said at the time she "feared for her life." 2009 - "Miracle on Montlake"
Ecstatic Huskies fans storm the field in celebration after defeating the heavily-favored No. 3 USC Trojans in an upset. Entering the game, the #3 Trojans had momentum and the national spotlight after their defeat of Ohio State in Columbus the week before. Washington, meanwhile, had just won its first game in 16 contests with a victory over Idaho. Southern California opened the game with 10 unanswered points, marching down the field at ease. USC was playing without starting quarterback Matt Barkley, who had injured his shoulder the week before at Ohio State, but despite playing with back up QB Aaron Corp, the Trojans were able to lean on an experienced running game and veteran offensive line. Washington worked its way back into the game with a 4-yard TD run by quarterback Jake Locker, trimming the score to 10-7. Late in the second quarter, placekicker Erik Folk kicked a 46-yard field goal to tie the score at 10. As the game entered the fourth quarter, the score remained tied. After swapping field goals, the Huskies took over with four minutes to play. Locker maneuvered the Huskies down the field, converting on two key third downs, including a 3rd-and-15 from his team's own 28 where Locker threw across the sideline to Jermaine Kearse for 21 yards. The Huskies would eventually drive to the USC 4-yard line before Folk kicked the game-winning field goal for the 16-13 win. On September 19, 2009 the Washington Huskies knocked off the #3 USC Trojans at home, a win that catapulted them into the top 25. 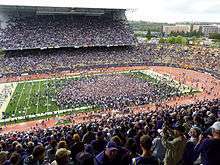 On October 2, 2010 the University of Washington Huskies were riding into the Grand Ol' Lady to face the #18 ranked USC Trojans, a place where they hadn't won since 1996 and also enduring a 13-game road losing streak. They hadn't won on the road since November 3, 2007 against Stanford. The Huskies had the lead for parts of all 4 quarters but never put the game away, including a play in which Jake Locker had the ball stripped out of the end-zone on what was a sure touchdown run. A week prior, Locker was 4-20 against a stifling Nebraska team, he completed 24 of 40 pass attempts for over 300 yards and also ran for 111 yards. Locker did leave the game for 1 play after a knee to helmet hit on a quarterback sneak. Keith Price, a redshirt freshman from Compton, California came in and promptly completed a touchdown pass putting the Huskies ahead 29-28. On the following possession the Trojans hit a field goal to take a 31-29 lead. The Huskies were unsuccessful on the ensuing drive and the Trojans took the ball down the field and with 2+ minutes left, missing a field goal off the right goal post. The Huskies final drive started with two incomplete passes and a near fumble, but on a fourth and 11 Jake Locker completed a pass to a leaping DeAndre Goodwin. The Huskies continued to push the ball down the field into field goal range in a similar situation to the previous year. With 3 seconds left, Erik Folk was kicking with the stage set for a dramatic Husky victory. Trojans coach Lane Kiffin called 2 timeouts, though his attempted icing failed and Erik Folk nailed the game-winning field goal as time expired and the Huskies won their first road game in three years. Since the 1970s, the Huskies have worn gold helmets with a purple block "W" on both sides. However, during Jim Lambright's tenure, the Huskies wore purple helmets with a gold "W."
During Jim Owens' tenure, he would award an outstanding defensive player the honor of wearing a purple helmet during the game. Rick Redman, an All-American linebacker in the 1960s, wore one. It was rather intimidating for the opposing quarterback to stand behind his center and see this lone purple-helmeted player staring him down before each play. In 2004, the Huskies switched to a new style of uniforms that were worn up until the 2009 season. In 2009, the Huskies' uniforms were changed to a new style. For the 2010 season, the Huskies' home jersey was altered to match the style of their away jerseys. On November 18, 2010, in a home game (Senior Game) against UCLA, the Huskies used a "black out" theme, wearing all-black jerseys and pants while encouraging the entire crowd to dress in all-black as well. On the road for the Apple Cup, the Huskies wore the black pants with their normal white jersey. Black jerseys and pants were worn again for the 2010 Holiday Bowl. On September 28, 2013, the Huskies debuted their metallic gold helmets. The helmets had the same design as the traditional "W" but with a metallic shined finish. They wore these helmets with purple tops and bottoms in a rain soaked match against the Arizona Wildcats. On October 12, 2013, the Huskies debuted matte black helmets. The helmets featured a purple "W" and two truncated purple stripes. On April 18, 2014, Nike revealed new uniforms for the Huskies. These included gold, white, black, and chrome gold helmets; purple, white, and black jerseys; and purple, gold, white, and black pants. Alaska Airlines Field at Husky Stadium has served as the home football stadium for Washington since 1920. Located on campus and set next to Lake Washington, it is the largest stadium in the Pacific Northwest with a seating capacity of 70,083. Washington has led the modern Pac-10 Conference in game attendance 13 times, including nine consecutive seasons from 1989 to 1997. With nearly 70 percent of the seats located between the end zones, covered by cantilevered metal roofs, Alaska Airlines Field at Husky Stadium is one of the loudest stadiums in the country and is the loudest recorded stadium in college football. During the 1992 night game against the Nebraska Cornhuskers, ESPN measured the noise level at 135 decibels, the loudest mark in NCAA history. A $280 million renovation of Husky Stadium began on November 7, 2011. Home games were moved to CenturyLink Field for the 2012 season while construction took place. The newly-renovated Husky Stadium reopened on August 31, 2013 in a game in which the Huskies defeated Boise State by a score of 38-6. 20 different Washington players have been recognized as consensus All-Americans, by virtue of recording a majority of votes at their respective positions by the selectors. Top finishes of Washington players in voting for the Heisman Trophy. Wikimedia Commons has media related to Washington Huskies football. ↑ "Sean Constantine out for 2016 season with broken ankle, plus a season-ticket update". Tacoma News Tribune. Retrieved September 12, 2016. ↑ "University of Washington Athletics Identity Standards Manual" (PDF). Washington Huskies. 2012-01-06. Archived from the original (PDF) on 2015-07-06. Retrieved 2015-11-28. 1 2 2012 DI Football Records Book - FBS section - National Collegiate Athletics Association (PDF). Indianapolis, IN: The National Collegiate Athletic Association. 2012. pp. 73–74. Retrieved 2012-10-31. 1 2 2012 Washington Football Information Guide & Record Book (PDF). University of Washington Athletics. 2012–13. p. 82. Retrieved 2012-10-31. ↑ "2012 NCAA FOOTBALL RECORD BOOK" (PDF). NCAA. p. 64. Retrieved February 6, 2013. 1 2 3 "2014 NCAA Football Record Book" (PDF). NCAA. p. 117. Retrieved 2014-10-17. ↑ "Washington Yearly Totals". College Football Data Warehouse. Retrieved 2010-07-12. 1 2 "2012 Pac-12 Media Guide". Pac-12 Conference. p. 5. Retrieved February 6, 2013. ↑ "Football Bowl Subdivision Records" (PDF). NCAA. p. 109. Retrieved 2011-01-01. ↑ "2012 Pac-12 Media Guide". Pac-12 Conference. p. 80. Retrieved February 6, 2013. ↑ "Quarterback U: Which school deserves the title?". Altoona Mirror. Retrieved February 6, 2013. 1 2 Johnson, Derek (2007-07-24). "Dobie, Gilmore (d. 1948)". historylink.org. ↑ "Player Bio: Claude Hunt - University of Washington Official Athletic Site". Gohuskies.com. Retrieved 2013-02-13. ↑ "University of Washington Official Athletic Site - Traditions". Gohuskies.com. 1922-02-03. Retrieved 2013-02-13. ↑ David Eskenazi. "Wayback Machine: Bagshaw's roaring Twenties | Sportspress Northwest". Sportspressnw.com. Retrieved 2013-02-13. ↑ "Player Bio: Enoch Bagshaw - University of Washington Official Athletic Site". Gohuskies.com. 1930-10-03. Retrieved 2013-02-13. ↑ "Player Bio: James Phelan - University of Washington Official Athletic Site". Gohuskies.com. 1979-11-14. Retrieved 2013-02-13. ↑ "Darrell Royal, Former Husky Coach (1924-12)". SportsPressNW.com. November 7, 2012. ↑ "John Andrew Cherberg". HistoryMakers. Washington Secretary of State. Retrieved 2013-01-19. ↑ Withers, Bud (June 6, 2009). "Jim Owens, coaching legend of UW football, dies at 82". Seattle Times. ↑ "Sarkisian has 'it' factor UW needs". 1 2 "Pac-12 Conference - 2012 Football Media Guide". Catalog.e-digitaleditions.com. Retrieved 2013-02-13. ↑ "COLLEGE FOOTBALL HALL OF FAMER JIM OWENS DIES". National Football Foundation. June 8, 2009. Retrieved February 6, 2013. ↑ Carpenter, Les (June 20, 2002). "Billy Joe Hobert: Villain, hero? Debate rages". The Seattle Times. ↑ "Neuheisel said he feels vindicated by settlement". Sports.espn.go.com. 2005-03-08. Retrieved 2016-09-12. ↑ "USC Trojans hire Steve Sarkisian from Washington Huskies as new football coach". Espn.go.com. 2013-12-03. Retrieved 2016-09-12. ↑ "Washington hires Chris Petersen away from Boise State | NCAA Football". Sporting News. 2013-12-06. Retrieved 2016-09-12. 1 2 "2009 Football: Pac-10 Champions, Annual Individual Statistical Champions" (PDF). CBS Sports. ↑ "1990 AP Final Football Poll". AP Poll Archive. ↑ "Rothman's FACT Rankings". David Rothman. Retrieved 28 December 2009. ↑ Miller, Ted (November 17, 2003). "Apple Cup of 2002 turned crazy". Seattle Post-Intelligencer. ↑ Huskies players are seen wearing helmets without any logo in 1966, 1968, 1971 and 1972. From this page of programs, the "W" logo had appeared by 1975. ↑ Condotta, Bob (November 15, 2010). "Huskies planning to "black out UCLA". The Seattle Times. ↑ "UW Adds BYU, Michigan To Future Schedules". Gohuskies.com. 2014-08-21. Retrieved 2014-08-22. ↑ "Future Football Schedules - GoHuskies.com | University of Washington Athletics". GoHuskies.com. Retrieved 2016-09-12. ↑ Caple, Christian (August 23, 2016). "Sean Constantine out for 2016 season with broken ankle, plus a season-ticket update". www.thenewstribune.com. Tacoma News Tribune. Retrieved September 12, 2016. ↑ "A Place Apart - Husky Stadium". Columns Magazine. Washington.edu. March 2002. Retrieved 2012-08-14. ↑ "Artificial Turf History, Applications, Advantages & Technical Information | Artificial Turf | Synthetic Grass | Los Angeles | Frass". Frassfakegrass.com. 2009-08-28. Retrieved 2012-08-14. ↑ 04 Jul 12 (2012-07-04). "Synthetic Grass / Artificial Turf History, Applications, Advantages & Technical Information | Home Turf". Sdhometurf.com. Retrieved 2012-08-14. ↑ Archived July 27, 2010, at the Wayback Machine. ↑ "Artificial Grass and Synthetic Turf Systems for Athletic Fields, Landscaping, and Commercial Building | FieldTurf - Synthetic Turf | Artificial Grass | Artificial Turf". FieldTurf. Retrieved 2012-08-14. ↑ "Husky Stadium - History, Photos & More of the former NFL stadium of the Seattle Mariners". Stadiumsofprofootball.com. 1920-11-27. Retrieved 2012-08-14. ↑ "Washington hands Boise St. worst loss under Chris Petersen". ESPN. September 1, 2013. Retrieved September 12, 2016. ↑ "University of Washington Official Athletic Site - Facilities". Gohuskies.com. Retrieved 2012-08-14. ↑ "Numbers you don't mess with in the Pac-12 - College Football Nation Blog". ESPN. 2015-06-03. Retrieved 2016-09-12. ↑ "2012 Washington Football Information Guide & Record Book" (PDF). CBS Sports. ↑ "NCAA Football Award Winners" (PDF). NCAA. 2012. ↑ "College Football Hall of Famers.". collegefootball.org. Retrieved 2010-01-06. ↑ "Pro Football Hall of Famers.". profootballhof.com. Retrieved 2010-01-06. ↑ Washington Athletics (2012-12-09). "Trufant Wins UW's Flaherty Award And Defensive MVP - GoHuskies.com | University of Washington Athletics". GoHuskies.com. Retrieved 2016-09-12. ↑ Washington Athletics (2015-11-28). "Tupou Wins 108th Annual Guy Flaherty Award - GoHuskies.com | University of Washington Athletics". GoHuskies.com. Retrieved 2016-09-12.